Today morning I downloaded a Chinese movie. Though the movie was very good I couldn’t enjoy because of the language barrier. So I was looking for the movie subtitles in English and was not able to find them. After searching for a while I found the subtitles with the help of a very useful software Sublight. 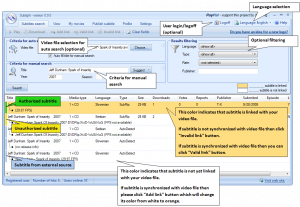 Sublight freeware is a very useful subtitle search utility which will definitely save a lot of your time. So by downloading the subititles you can watch the movie in your regional language. Sublight will help you to search for subtitles for your movies. One more good thing is that you can even preview the subtitles before downloading. Sublight is currently available in three languages and supports 27 subtitle languages. Wide support of multiple languages will definitely help you to find subtitles very easily. Search subtitles automatically and manually. Subtitle ratings and commenting are allowed. Subtitles are saved in Unicode encoding. Automatically detects the video codec. Supports VLC Player, BS.Player, KMPlayer, Media Player Classic, Windows Media Player, Zoom Player and GOM player. Free registration enables you to publish new subtitles. Plugin framework for searching subtitles from other applications. Supports OpenSubtitles.org, Podnapisi.NET and divx-titlovi.com databases. SublightCmd command line interface for advanced users. Great info man. Thanks. Now i can watch any other language movie if i get the subtitle in english.